The elephant-faced-Deity of the Hindus known popularly as Ganesha has intrigued all thinking men all over the world, all through the ages even unto the present day. They are puzzled as to how a cultured class of people going by the name of Hindus could have denigrated themselves by worshipping this funny looking elephant-faced-Deity giving him an eminent status in their pantheon. You go anywhere in India you will find him in the Hindu temples, thoroughfares, public parks, pavements, bathing ghats and even on hill tops and wherever the Hindus went they took with them this Deity and secured for him a status not less than what he held in the country of his origin. Besides India, Tibet and Nepal, he is also found in almost all countries in South East Asia and even in China and Japan. It is surprising to note that in the distant Mexico the cult of Ganesha was prevalent as is revealed by his figures discovered in the archaeological excavations in that country. 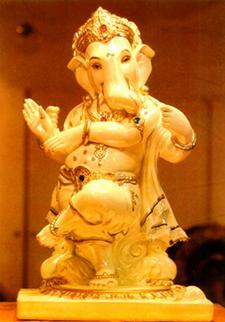 Recently, in U.S.A. also a Ganesha temple was consecrated at Flushing, a suburb of New York. The reverence and devotion for him in India and also elsewhere have not abated even in these days of free thinking and rationalism. He is invoked by all classes of orthodox Hindus in all walks of life for success in their endeavours and thanked profusely after success. In an elated state of mind a high ranking Hindu Naval Officer is reported to have broken 108 coconuts before the image of this Deity in an unofficial thanks giving ceremony for his victory in a naval engagement over the Pakistan Navy in the 1971 war.